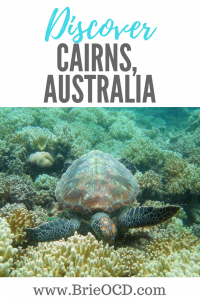 Cairns (pronounced Cans) is in the Northeast part of Australia and is BEAUTIFUL. 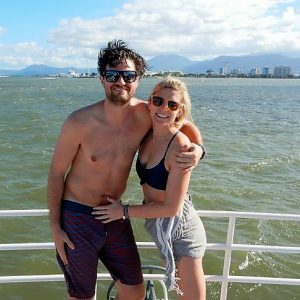 Coming from San Diego I am a beach bum and Cairns definitely fit the bill. Unlike San Diego it is also very tropical and full of luscious green plant life. It is near the Rainforest (where the Rainforest meets the ocean) and also has a ton of wildlife. Every morning we were wakened by a cockatoo screaming to his friends. I literally laughed out loud at 3am because it reminded me of this bird in Belize that would wake us up in the wee hours of the morning. Cairns (and Australia in general) is expensive. Plan to spend at the very least 50 AUD every time you even attempt to dine out. (that is the equivalent to about $38 USD). Its worth it though, so save your money and get ready for an adventure mate! 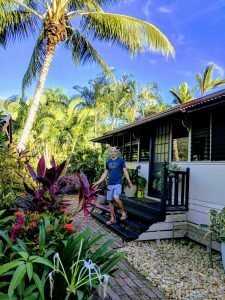 We rented an Airbnb in Palm Cove with our friends P-Roy and Riki and I would stay at the Sweet Creek Cottage over and over again. It was so cute and close to all of the restaurants and shops in Palm Cove. Please note: do not leave a crumb unattended because the local bugs will come to scout it out. You are basically in the middle of a wildlife party where anything is game. None! I loved it! If any of you know me, you know that I am an early bird. I don’t really like to go out at night so Cairns/Palm Cove was perfect for me! Unless you plan to stay in Downtown Cairns the entire time you will need to rent a car. 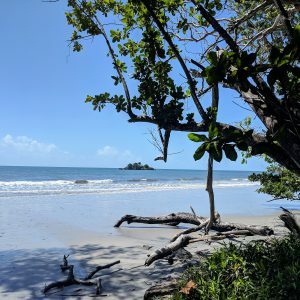 We rented a car for 4 days with full insurance coverage for 265AUD through Europcar and was able to drive to the Rainforest, Port Douglas and to the market with no problems. The roads are big here so it is a good place to get used to driving on the opposite side of the road (and car). If you want to Uber it will cost you approx. 85AUD from Cairns to Port Douglas and about 65 AUD from Cairns to Palm Cove. If you want to go to the rainforest and don’t have a car I would look on tripadvisor to book a trip. 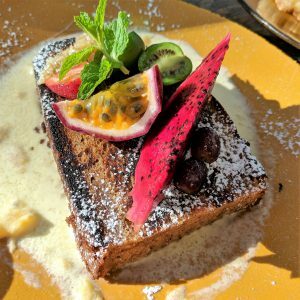 Chill Café in Palm Cove – The breakfast here is AMAZING. You get a prime view of the water and a very chill ambiance. We got a large latte and the eggs, bacon and ciabatta toast. We also split the homemade banana bread with mango mascarpone and berries. The portions are BIG so I was definitely stuffed. Also go for happy hour and get some grilled fish tacos and Mezze platter. It has a great selection of meats, cheese, falafel, olives, roasted veggies, etc. They also have $5 house wine and beer and live music later at night. 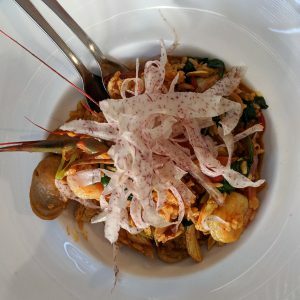 The Rising Sun in Palm Cove – Appetizers and sangria are just ok here. Go for the Pork Ribs! They are so tender and delicious. I promise, you will clean the plate! Monkey Joes in Port Douglas – Breakfast – Homemade scones with homemade jam and mascarpone. I don’t even like scones and I am still dreaming of these. The bacon and egg sandwich was also noteworthy. The bread was toasted so perfectly and just delicious. Grab a latte and you have yourself a perfect breakfast on the way to the Daintree Rainforest. 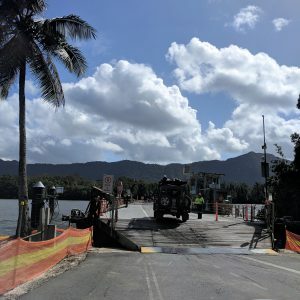 Seabean in Port Douglas – Skip it. This place received good reviews on Tripadvisor and served food at 3 when no one else does. The couple tapas we had were good BUT it is overpriced and the portions are super small. I know tapas are small plates but these were the baby of the tapa. Literally a bite. Salsa in Port Douglas – Right across from seabean – Don’t let the cheesy logo fool you. The food and the view is amazing. Not cheap (but nothing is) and so good! 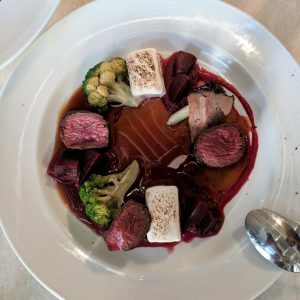 Get the watermelon cocktail or a glass of cold wine and hunker down for some delicious seafood and meat. We all shared the pulled pork stuffed peppers, calamari (I didn’t love this b/c I think RI has the best calamari, but I’m biased), fettucine braised meat dish, jambalaya and kangaroo. All were really good. I would definitely go back. After dinner walk across the park and watch the sunset. Fruit Bats: See the Fruit Bats outside library downtown Cairns. 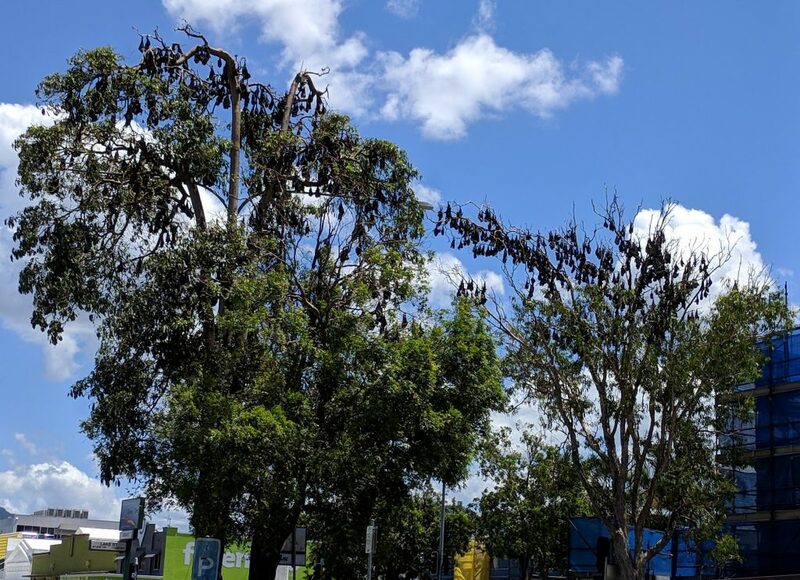 Just look up in the trees while downtown in Cairns and you will see thousands of fruit bats just chilling and looking down at you. They are harmless bats that apparently make good pets (I won’t be finding out). 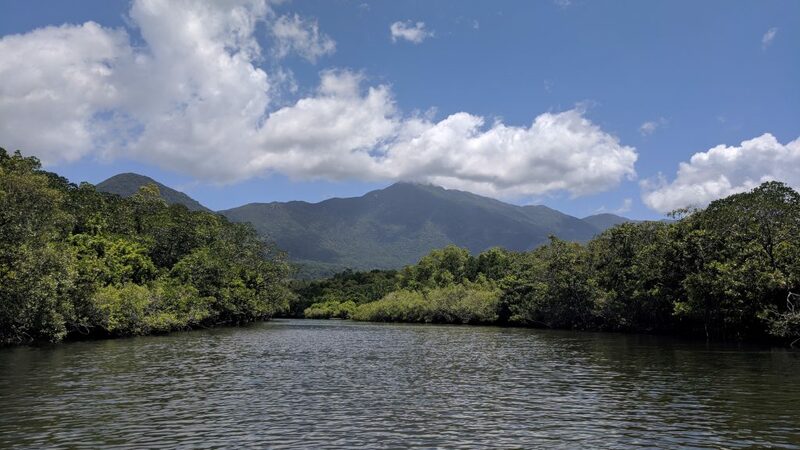 Daintree Rainforest: Rent a car or book a guided tour of the rainforest. Just seeing the green and natural beauty of Australia was amazing and so different from San Diego. On the way to the rainforest you have to hop on the ferry with your car. It costs 27 AUD for a roundtrip ticket. You simply pay before boarding onto the ferry and keep the receipt for the ride back. 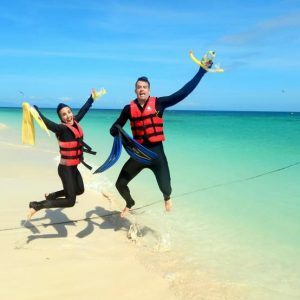 We headed up to a company called PK jungle adventure b/c we were thinking of going ziplining through the rainforest, then we realized we did that in Costa Rica so we didn’t need to do it again. 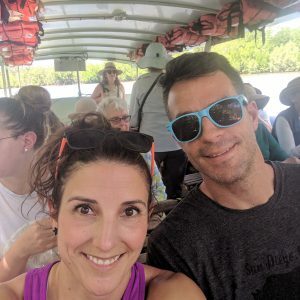 We chose the crocodile boat trip for 33 AUD per person. It was very informative however we only saw one croc bathing on the side. Apparently when the water is hot they stay in it and you don’t see that many (wish they told us that in advance lol). Either way, the tour was an hour and was something different. After that we went and did a couple of the hikes that were on the map. Be on the lookout for Cassowaries! They look like ostrich and are apparently dangerous but beautiful birds. You can also go to the Discovery Center and learn about the area and do a hike/activity area that takes about 2 hours (we skipped this because we stopped there last and had already hiked a lot). There is such beauty in the rainforest and a great way to get some exercise. I suggest renting a car to see the beauty on your own time and stopping off at the random trails listed on the map. 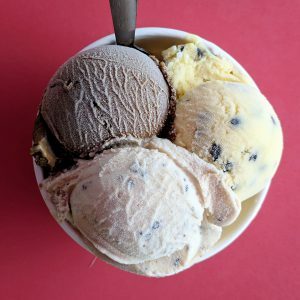 Don’t forget to stop for the local Daintree Ice Cream Company for some delicious homemade ice cream with unique flavors such as wattleseed, passionfruit and black sapote. 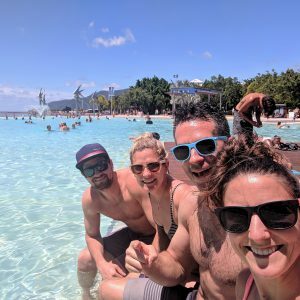 Great Barrier Reef: WARNING: Me and half the boat got seasick so if you even get an inkling of motion sickness I strongly advise to take Dramamine in advance! We booked a tour through Seastar (while sick I labeled it the deathstar). The crew was super nice but I would recommend the half day tour aboard the Skedaddle. 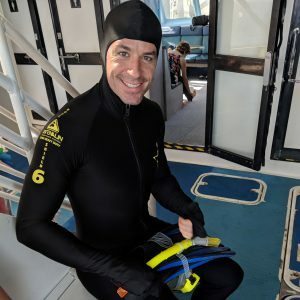 The full day snorkeling tour (which is what we did) will run you 210 AUD and goes to two spots. However, Michelmas Bay didn’t have that much to see OR maybe the visibility was just bad. Hastings Bay was amazing and was worth the trip. The half day trip on the Skedaddle costs 115AUD and in my opinion is all that you need! Cairns Public Pool: There is a giant pool of water open to the public. Head over with a towel and take a dip and just relax in the surrounding grassy area. Proy, Riki, Hancy & Me Cooling Off! Downtown Cairns: Just walk around downtown Cairns and browse all the shops bars and restaurants (and the bats mentioned above). My favorite bar was The Courtyard (right across from public pool). 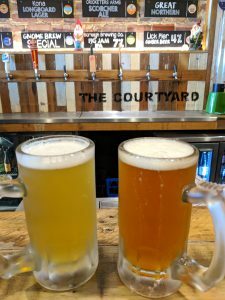 Great beer and cool décor with an outdoor patio. 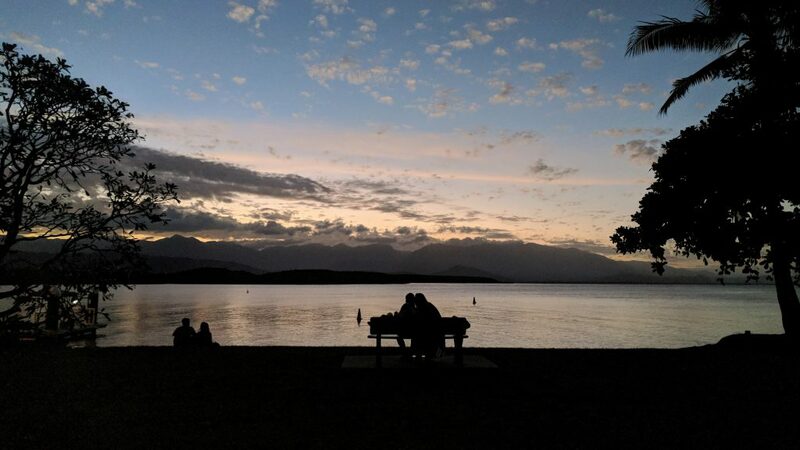 Port Douglas – So many cute shops and restaurants. Worth the drive to go browse around. Have a flight of beer at Hemingways or a glass of wine right by the water and relax! Palm Cove – such a cute little area with a main strip of restaurants and shops. We stayed at the best little Airbnb in the area and really loved the chill relax vibe. Only 25 minute drive to Cairns, 45 minutes to Port Douglas and about 2 ½ hrs from Daintree Rainforest. A nice little getaway from the main city with good food and a rainforesty beachy vibe. 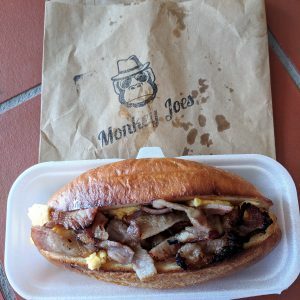 Pro tip – All restaurants stop serving food in Cairns from 3-5. Some places offer small bites during this time but don’t expect to get a full meal. Moral of the story….. stay in Palm Cove and eat at the Chill Café. 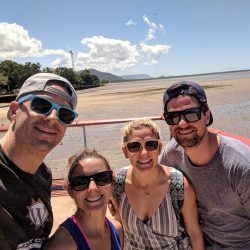 Stroll around Downtown Cairns and go to Port Douglas to walk around the shops, have a couple drinks and food. Visit the Daintree Rainforest and do a half day on the Great Barrier Reef. 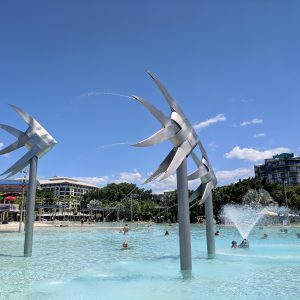 Relax and enjoy the beauty Cairns has to offer! Love… Very informative and detailed..Thank you..